Non-alcoholic fatty liver disease (NAFLD) is the generic term used to describe conditions that cause fat to build up within the liver. It is a common disease that often occurs in people who are overweight or obese, including those with type 2 diabetes. How serious is non-alcoholic fatty liver disease? For most people, having small amounts of fat in the liver cells usually causes no problems. But for others, the build-up of liver fat can lead to serious health problems. NAFLD, in particular, increases the risk of cardiovascular issues such as heart attack and stroke, which makes it particularly dangerous for people with type 2 diabetes who already have a greater risk of cardiovascular disease. I have diabetes, how do I avoid non-alcoholic fatty liver disease? Lowering the risk of non-alcoholic fatty liver disease is generally a matter of gradual weight loss and maintaining regular exercise. This also helps to lower the risk of cardiovascular problems. The liver helps to store fuel (glycogen) made from sugars, breaking it down and releasing it to the bloodstream. Fats and proteins are processed and toxins are removed by the liver. Bile, which breaks down the fat in foods, is also created by the liver. What are the stages of NAFLD? Steatosis is where there is excess fat in the liver but not to an extent to cause symptoms to appear. As a result, fatty liver disease is often not picked up until a later stage. 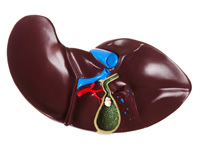 Steatohepatitis (NASH) occurs if the liver becomes damaged causing it to become inflamed. Symptoms such as a pain in the top right of your abdomen may be felt at this stage. Fibrosis is when fibrous scar tissue develops within the liver. The liver may still be able to function normally with fibrosis but its ability to function will decline if fibrosis continues to develop. Cirrhosis happens when normal liver tissues is replaced by fibrosis to the extent that the structure and function of the liver is affected and can lead to liver failure. About 2 in every 100 people with simple fatty liver develop cirrhosis over a 15-20 year period, while roughly 12 in every 100 people with NASH develop cirrhosis over 8 years. Isn’t liver disease down to alcohol? Another form of fatty liver can occur amongst people who drink alcohol excessively, but this is a separate condition. Will my non-alcoholic fatty liver disease progress to NASH? Only a minority of people develop NASH, the second stage of the liver disease, and only a minority of these then proceed to cirrhosis. If caught early and treated appropriately, the later stages of NAFLD are usually preventable. Is NAFLD common amongst people with diabetes? Risk factors for non-alcoholic fatty liver disease include type 2 diabetes. Type 1 diabetes alone does not increase the risk of developing NAFLD but the presence of other factors, as above, may do. Does having liver disease increase risk of developing diabetes? People who have NAFLD have a greater risk of developing type 2 diabetes and cardiovascular diseases. Usually, there are no symptoms until stage 2 develops. If NASH occurs, a nagging pain in the abdomen may be felt. Fine capillaries may appear at the surface of the skin above waist level and another symptom is build up of fluid in the abdomen, called ascites, which can give the appearance of pregnancy in either gender. No simple tests can diagnose NAFLD, but liver function tests can help you to understand the health of your liver. Abnormal LFTs may indicate the presence of fatty liver disease, and doctors can conduct other tests to rule out liver problems. A scan of the liver may also reveal the likelihood of NAFLD. Usually weight loss through diet and exercise can reduce the amount of fat in the liver. In some cases, obesity surgery is prescribed. Treatment of associated conditions, especially cardiovascular disease, may require lifestyle intervention. This can include stopping smoking, keeping weight down, regular physical activity and eating a healthy balanced diet. Avoiding alcohol is also good guidance, because moderate amounts of alcohol can make NAFLD worse.